Artists Envision Inclusivity in Art With "Engendering Change"
Members of the MTL Collective spoke at the annual "Engendering Change" conference on the power and complexity of action. Art holds power as a means to change systemic circumstances. And this power is not necessarily just in the art itself, but also in the community-building and formation-fostering capacities involved in the creation and distribution of art. As Nitasha Dhillon and Amin Husain, cofounders of the MTL Collective, put it, “art is the decolonial formation,” and it can happen during poster-making and community conversations. Dhillon and Husain came to speak on campus last Friday night as a part of the eighth annual “Engendering Change,” a Chicago-area graduate conference on gender and sexuality. This year’s conference was organized by Katie Hendricks, Alex Brewer, Rebecca Ewert, and Jean-Thomas Tremblay, with the help of Sociology Professor Kristen Schilt, and its kick-off event featuring the MTL Collective was curated by Chase Joynt—an artist, scholar, and currently a Social Sciences and Humanities Research Council postdoctoral fellow at the University. Within the MTL Collective, Dhillon and Husain have worked on many different projects in collaboration with other artists, organizers, and educators. In 2011, they collaborated with Occupy Wall Street, creating the magazine Tidal: Occupy Theory, Occupy Strategy to disseminate research and techniques related to the movement. The magazine featured articles on topics like “Commoning Against Debt,” focused on how to organize collectively around individual debts. But, as Husain pointed out, Occupy was not as successful as some may have hoped: “one of the failures of Occupy was that it thought class was everything,” causing it to ignore other influential factors like race and gender. After Occupy, the MTL Collective collaborated with the Gulf Labor Artist Coalition. The Coalition was working on a project called “52 Weeks,” whose goal was to raise awareness about the labor conditions at the construction site of the Guggenheim in Abu Dhabi, where workers are tied to the workplace, living in quarters away from their families. As the MTL Collective is based in New York, they also examined the conditions for workers in the New York Guggenheim Museum, finding that they were not making a living wage. Dhillon and Husain worked with the organization Gulf Ultra Luxury Faction (GULF) around these issues, attempting to meet with the museum board of trustees, but to no avail. So GULF staged an unsanctioned action on May Day 2015 around three central demands: living wage, debt jubilee, and the right to organize. 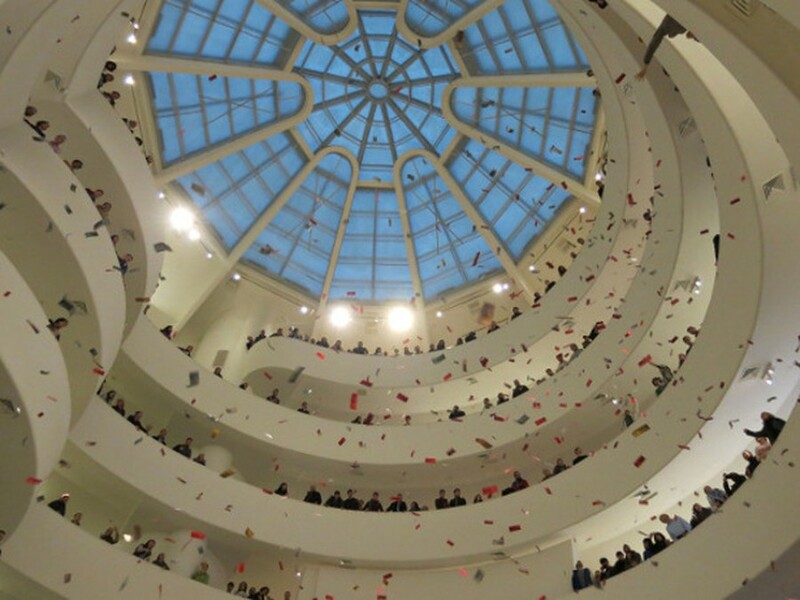 On this day, they had people enter the museum as regular visitors planted throughout the space’s upward spiral walkway. When the signal came, organizers on the ground floor opened a poster listing their demands while those standing above released hundreds of postcards and flyers, closing down the museum for the rest of the day. From this action followed another occupation of the Peggy Guggenheim Collection in Venice later that week. Dhillon and Husain are taking actions to confront institutions directly through their art, looking at decolonization as an alternative framework to the exclusionary nature of concepts like citizenship. Much of their work builds upon the theories and research of scholars like Judith Butler and Gayatri Spivak; out of research and conversation, they consolidate and disseminate messages through pamphlets and posters in collaboration with others. In explaining their goals, they describe them as visionary organizing—organizing around a future which they plan to build into existence—as opposed to reactionary organizing. They do not call themselves activists, as they see this label as creating an unnecessary binary—instead, they are artists finding projects about which they are passionate.